Only recently split from Serbia, the newly-independent nation of Montenegro is something of an oddity in Eastern Europe. Though they possess a strong sense of cultural pride, Montenegrin language, culture and history is inextricably linked to Roman and Ottoman occupation and – more recently – Yugoslavian nationalism. There’s a world of history in this tiny country, with countless museums, fortresses and old towns to explore. 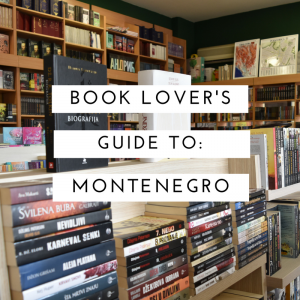 While we travelled across this fascinating landscape, we took the time to stop into a few bookstores and get an idea of what kind of literary pathos Montenegro has to offer. This bookstore, called ‘Bookstore,’ can be found on the Budva waterfront. Little more than an oversized kiosk, it nonetheless offers a surprisingly large selection of English paperbacks at reasonable prices. Here you’ll find books across a wide range of genres, from romance and YA through to thriller and fantasy. As a bonus, I enjoyed browsing the Montenegrin edition of Harry Potter, even though I couldn’t understand a word. X-Factor: Location, location, location! Situated right at the forefront of the Budva pedestrian road, you could step in, buy a summer read and enjoy the sun on the sand in the span of a single breath. This was the only bookstore we could find in the Montenegrin capital of Podgorica with the criminally short time we had. It’s a gorgeous store, flooded with light and books in both English and Montenegrin. Located in the middle of the central shopping district, Gradska is an easy bookstore to find. X-Factor: Their classics section was unusually diverse, and included works by popular authors that are typically harder to find. For example, they didn’t have 1984 by George Orwell, but they did have Homage to Catalonia, another lesser-known work by Orwell. I’ll be honest, the main reason for including this bookstore is the town of Cetinje. It’s an absolute must-visit if you’re in Montenegro, filled with quaint streets, incredible historical sights and beautiful views. Luca is an example of a more typical Montenegrin bookstore. Not only does it stock fiction, but it also sells stationery and school supplies. X-Factor: If you need to stock up on basic art supplies, notebooks or stationery, Luca has got you covered! My favourite bookish destination in Montenegro! Located inside the citadel in the heart of Budva’s incredible old town, you’ll need to pay a modest entry fee to explore. The library is a single, light-filled room packed with glass-fronted bookcases and displays. Everything in this room is maritime-themed; you’ll be forgiven if you believed for a moment that you’d stepped into the captain’s quarters of an old sailing ship! There are comfy leather sofas to rest in and model boats with descriptions in English as well as Montenegrin, telling stories of pirates, mutiny and shipwrecks! X-Factor: The model ships, painstakingly assembled, and their backstories on display. A second-hand bookstore in the stunning old town of Kotor, this odd little shop is both small and sweet. If you need four copies of Harry Potter and the Deathly Hallows, or a thriller by John Grisham, you might find something in the tiny, eccentric collection they stock. X-Factor: The cave-style décor will make you feel like you’re browsing a bookstore in an old communist bunker. That’s Montenegro wrapped up! We had a blast, but after ten days it was time to move on. Next week we’re reviewing Serbia, so stay tuned! Sorry Claire, but it’s been so long since I visited and wrote this article that I can’t provide any more specifics on top of what I’ve already shared 🙁 I hope you had a great time in Budva, it’s a lovely little town! I was hoping to track down an English copy of Budva The City of King Cadmus. Please could you advise where I might purchase a copy. Hi Allison – it’s been quite some time since you posted this so there’s every chance you’ve already found a copy but in case you haven’t, I can only really recommend the large online retailers like Book Depository or Amazon. From memory when we visited Montenegro, their English book selection was somewhat limited. Perhaps no one has translated that book into English yet? Thank you for your comment! I’d love to go back one day and explore the region some more, there’s so much history and so many stories to discover. I had no idea about Herceg Novi, but I’ll be definitely adding that to the list!